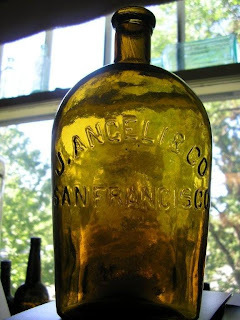 One of the most highly sought after western glob flasks is the J. Angeli & Co. San Francisco(tf-2). With just 6 known examples, this is an extremely rare bottle. Not much is known about the bottle, other than what is published in Thomas' Whiskey Bottles. It is certainly an early flask, by all appearances, and all of the known examples have been found in California I believe. The Angeli is a different shape than other western flasks, being deeper through the shoulder area than the other early western flasks. I don't have a handle on when the Angeli was actually distributed. J. Angeli & Co. was listed in the San Francisco directories at 524 Washington St. in 1869-1870, then at 211 California St. in 1871-72. You might expect the bottle to be more commonly found if sold for 4 years. It is larger than a pint, and I have seen 5 of the known examples; 2 in darker olive amber, 2 in more of a yellow olive amber, and 1 in lighter green amber. Does anyone have anything additional on the Angeli flask?? Newspaper ads, bill heads, any other info at all?? Please send it along and I will ad it to this post. Sole Agent, I'm glad you brought this up. This bottle has always been a bit of an oddball to me as well. I have had encounters with it, having bought, back in 1991, a mint medium-amber example that was dug amongst 1890s bottles in an old well. This example is the only example I have seen w/o any olive in it. I have also dug 3 broken examples. Secondly, the only other Western flask with this similar nonconforming base is the horizontal Wormser. They are both also what I call a "fat-boy" flask or a "wide-body" flask. These flasks could've been done by the same mold-maker at the same glass factory. Yes, you already read my mind. I'm waiting for the champagne-top Angeli to surface... and it will. Thirdly, there is a connection with the Angeli Co. and Wormser. It's mostly in the " & Co." part. Angeli's former partners, Richard Braeg and Emmanuel Frank moved into Wormser's bldg at the SW corner of Cal & Front St in 1873 as the Wormser Bros were exiting. As you stated, Angeli moved into 211 Cal St in 1871, so these guys (Angeli & Co and the Wormser Bros) had to have been practically next door neighbors in 1871 and 1872, which is about the right time for when the Angeli flask, the Wormers flask,the John Van Bergen, and the Hotaling Cutter shldr-crown to have been in circulation. So, if I had to call it, it would be the Angeli flask at the 211 Cal St address, and in use during 1871-72 only.